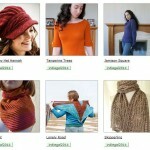 a knitter starts to think about Fall. Isn’t that always the way? Lately my mind had been on hoodies. I wear them a lot – I practically live in them on the weekends. Perfect thing to spend my time on, right? Plus, it passes the Rhinebeck test. 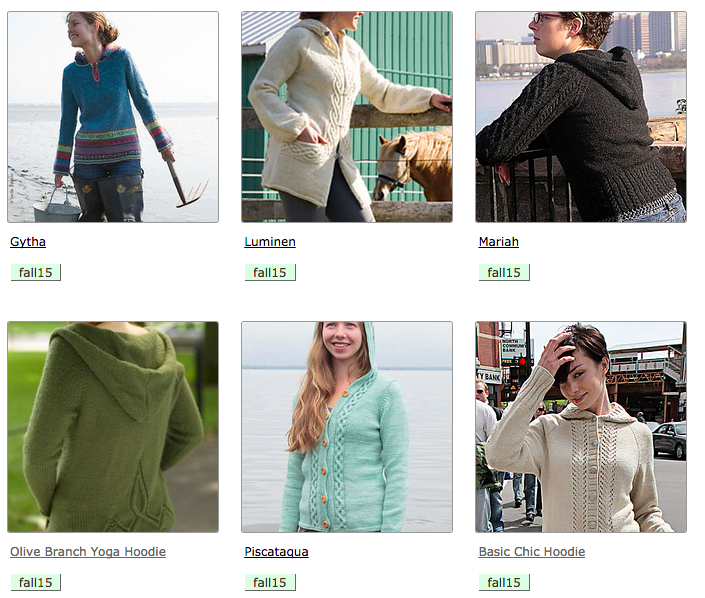 I’d love to walk around the fairgrounds in a newly-knitted hoodie. I started a Charleston Tea but in worsted instead of sport. After 20ish rows it’s clear – I don’t like it. The cables are pretty but the designer is right – they should be in a thinner yarn. Ok, back to the drawing board. Here are a few hoodies I’ve had my eye on for this Fall. Nutkin by Melissa Schaschwary – also not a hoodie but it could easily get one on it. Briquette by Alicia Plummer – it’s hard to see but there’s an asymmetrical line of rev st st on the body. I’ve learned that asymmetrical doesn’t look good on me so I’d make it symmetrical. Fickle Heart by Justyna Lorkowska – the cables and lace make this one a nice feminine option. Miranda by Josee Paquin – I like how she’s designed the kangaroo pocket to work right in with the cables. Plus I already own the pattern. See You There by Joji Locatelli – the central texture and back are pretty and the sleeves have a bit of detail too. 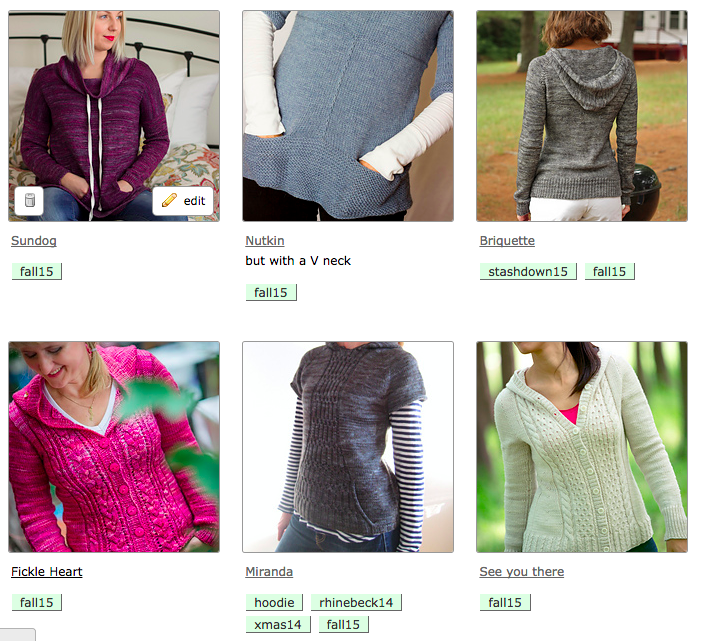 Gytha by Jennifer L. Appleby – I love the mostly-solid but with splashes of color in the hood, arms and bottom of the bodice. Maybe my gateway stranded project? Luminen by tikru – look at the cool way the pocket is incorporated into the cabling. Mariah by Jodi Green – yep, it’s back on my list again. Olive Branch Yoga Hoodie by Kirsten Hipsky – and not just because I’ve been working my way into some yoga. Look at that back cable detail. 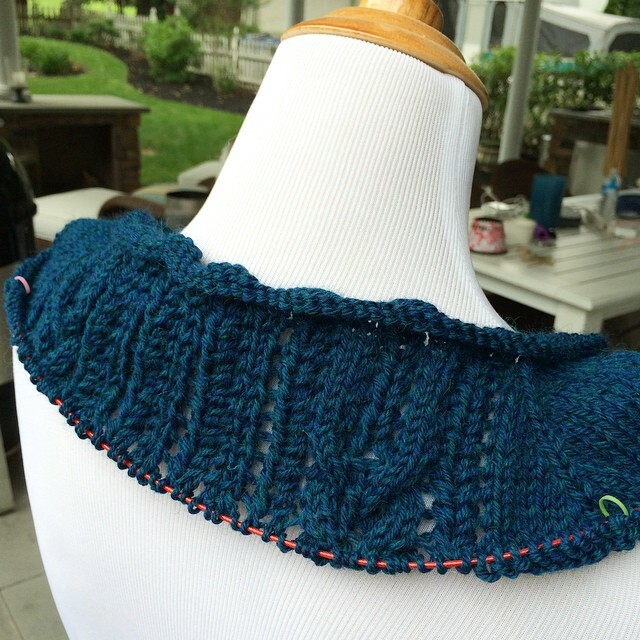 Piscataqua by Alison Green – the pic looks pretty simple but it’s another one with a back cable V detail. Basic Chic Hoodie by Bonne Marie Burns – Bonne Marie has several hoodie patterns but this one stood out to me because it’s mostly st st but with some lacy details. Top down raglan – I like the fit, the try on as-you-go, the knitting style (once you get done with the yoke it feels like you motor through) and it fits my body shape well. If the design isn’t top down raglan I’ll likely mod it so it is. 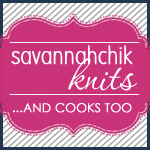 Worsted weight – they all are made with worsted weight. A hoodie is a good amount of knitting and it’s supposed to be warm. 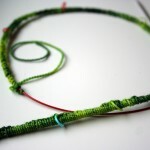 Most have cables or lace – something to keep the knitting interesting – but they aren’t overly fussy. I like that. 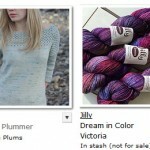 Pullover or cardi – I’m undecided about this one. They both have their advantages. I’m still terrified about putting a zipper into my knitting and I don’t really like the look or function of buttons on a hoodie. Hmm – maybe magnetic snaps? What do you all think? What did I miss? What would you pick? I’m a bit earlier than normal for my typical fall planning but I might actually get something done this way. knitspiration cardi, hoodie, pullover, sweater. permalink. I vote Gytha. Great colors. But you probably can’t go wrong. I love Briquette! I could really see myself wearing that! totally – i love hoodies! and i know in a couple months i’ll be thinking how i need a hoodie but i won’t have time to knit it. I’ve been thinking hoodies as well. Since I haven’t made a Central Park hoodie yet that is the one that has been on my mind. Of the ones you have selected I would probably choose Piscataqua since I prefer the set in sleeve and am way to lazy to adapt the pattern. And Sundog looks looks so cozy I might need to add that one. Since it will be wool season before you know it I better make a decision soon. I really love to see these collections you put together. i’m glad you’re enjoying the collections! they help me too and i find myself coming back to them too. or using them when buying yarn (as if i need any excuses).